I have a proud confession to make – I fell in love with a new restaurant in Mayport so much that I ate there twice in one day. I repeat, I ate there twice in one day. Lunch and dinner, less than 6 hours apart. I can count on one hand the list of restaurants in Jacksonville that have wowed me to this degree. Newly opened Hangar Bay Cafe and Gallery stands proudly on that list. I first saw a post about Hangar Bay from a chef friend on Instagram and my interest was piqued immediately due to the menu. Are you ready for this? 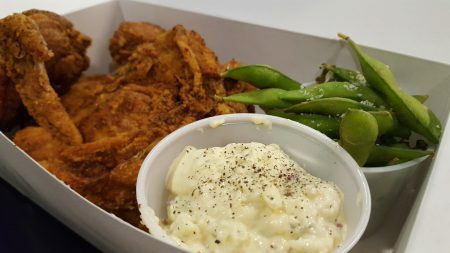 Under one tiny roof, nestled in a shopping center by the NEX, Hangar Bay Cafe is serving fried chicken and authentic ramen. This place may be heaven. Owned by Navy Veteran Chris Straw, Hangar Bay is not trying to be everything to everyone – the menu is simple and small and is focused on capturing comfort food from both sides of the world. My lunch visit was with my coworker. We walked in and immediately loved the unpretentious counter service set up. After being inundated with the smell of fried chicken upon entering, I knew immediately I was going with the fried chicken for lunch. Chicken can be purchased by 2 ($7 light or dark), by 4 ($9.75 half a chicken), or by bucket ($20, 8 pieces). Each comes with several side choices. We went with the edamame and potato salad. My coworker went the route of ramen and opted for the recommended tonkotsu ramen ($9). We sat down in the dining room which contains four community tables and our food was delivered shortly thereafter. 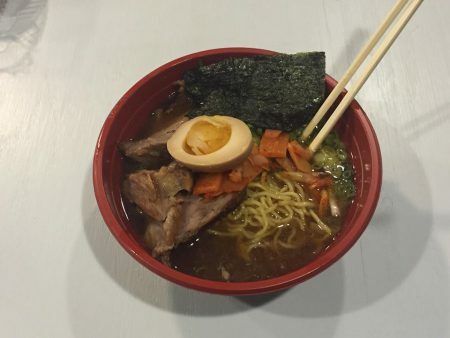 The ramen is a work of art. 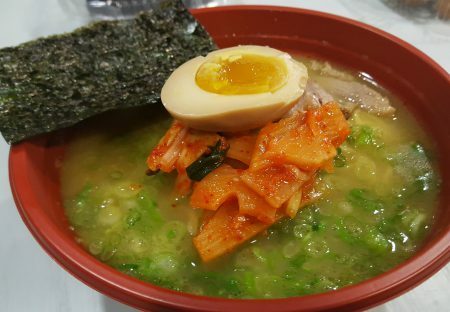 Each ramen is served with pork, scallions, a half seasoned boiled egg, naruto, bamboo shoots, and nori. The tonkotsu ramen has a pork bone broth base which creates a slightly sweeter and thicker soup. It’s packed with tender noodles, and the vegetables all hold their own with unique flavors and perfect preparation. This is how ramen is supposed to be done. Hangar Bay hits the nail on the head. I have several ramen pet peeves: A) when the noodles are too long to capture on chopsticks, and B) when the pork is too tough to tear through with chopsticks. Hangar Bay makes neither of these mistakes. My coworker easily ate his ramen with chopsticks the whole way through then enjoyed finishing the broth after. I’d say this is the “must order item” from the menu, but we need to talk about this fried chicken first. I’m a fried chicken snob. I was raised in Mississippi on weekly fried chicken dinners at church potlucks made with secret family recipes that have been passed down for who even knows how long. Hangar Bay’s fried chicken stands proudly as some of the best I’ve ever eaten. I prefer dark meat because I find the flavor is richer, so that was my box of choice. After bite one, my coworker exclaimed “Colonel Sanders may need to check his vault, his secret spice blend has been stolen!” And it’s quite true. The spice blend is remarkably close to the blend used in the original recipe, but without making the tragic mistake of fast food soggy batter. The batter evenly coats the chicken without being so thick that it holds grease, and the spices within the batter come through every bite. The chicken was incredibly juicy without the oily residue left on poorly fried chicken. It’s evident this is a recipe that is tried and true. The temperature is perfect, the batter is perfect, the timing is perfect. You simply cannot improve on Hangar Bay’s fried chicken. I also quickly fell in love with the edamame side dish. Sea salted and steamed to just tender, I could have snacked on these all day. The potato salad is a version heavier on the mayonnaise and diced onions. With a tiny bit of pepper added we found ourselves scraping the container. About halfway through our meal Chris came by to check and make sure everything was satisfactory. He explained they’d only been open a few weeks and he would truly appreciate it if we’d make sure to pass on the word that they were open. I took this literally, which resulted in trip #2 for dinner with fellow food blogger Jill Cruz. Chris laughed as soon as I walked in, and I told him I took his request to heart. 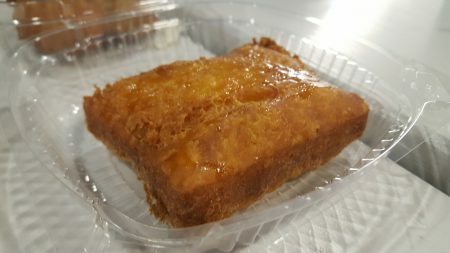 For this visit, we opted for a heartier selection including their speciality fried mac and cheese ($5), jalapeño poppers ($4), the curry ramen ($9), the shoyu ramen ($9), and the triple fudge chocolate cake because cake ($5). Our jalapeño poppers arrived first. One bite in and molten cream cheese exploded everywhere mixed with the spicy sliced jalapeno and crispy batter. We absolutely loved these. They had the right level of heat mixed with cheese to make them easily edible even for people who don’t love spice. The winning appetizer was the fried mac and cheese. No one will ever be prepared for this. 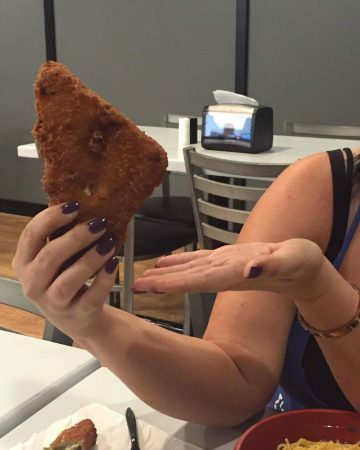 The fried mac comes in two triangles and each triangle is roughly the size of my face. Unlike most fried mac and cheese, the creaminess of the mac isn’t lost in the frying process. This is just like eating hearty, comforting, cheesy mac and cheese except made incredibly more delicious and sinful with a thick crispy batter. Order this. Trust me. You’ll love and hate me so much because you’ll be addicted after bite one. Our ramen proved equally as comforting as my coworker’s lunch. Jill’s shoyu ramen had a soy base that was salty and sweet at the same time. My curry ramen was fantastic. It had a mild curry flavor without the heat of traditional curry. Jill’s evaluation of the curry ramen is that it was exactly like the top ramen places she visits in Chicago, so the authenticity is verified. After tasting all three, I personally prefer the curry version over the tonkatsu and soy. The dramatically varied flavors and even textures should make finding a ramen easy for every palate. Mid meal, Chris visited us again to check in on our dinners, and we told him at that point that we would be telling the masses about the incredible food and experience. We chatted for a few minutes, then shortly thereafter he brought us a fried biscuit to try. A FRIED BISCUIT Y’ALL. This is the most tender and flaky biscuit that is flash fried to add extra crispiness. All I could think of was drenching it in honey and eating it for breakfast, lunch, and dinner. This is the side item to end all side items and a must order. 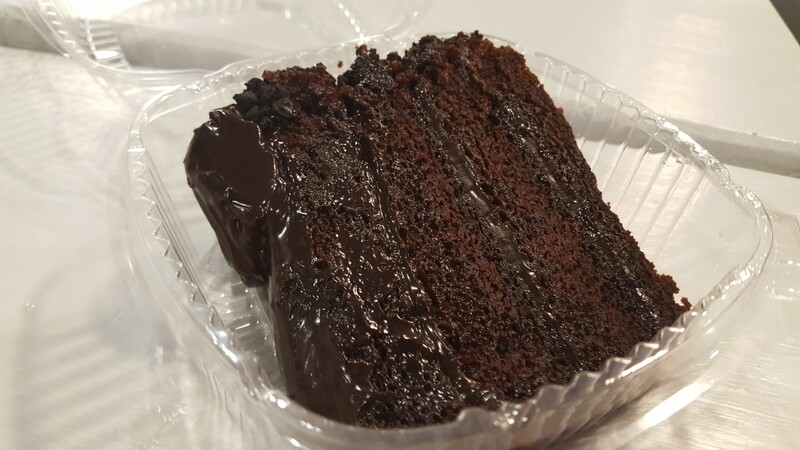 We finished our meal with the triple layered chocolate cake that would put even the most dedicated sweets lover into a small coma. There are so many reasons to support Hangar Bay. The military bases in Jacksonville bring so much to our city and bring a diversity of experiences from around the world to create a cultural mecca. I love the fusion of the comfort food of ramen that is reflective of Chris being stationed in Japan with the comfort food of the south in the fried chicken menu. While a restaurant that serves fried chicken and ramen may sound crazy, it works here. It’s comfort food at it’s finest. It’s soul warming, it’s relaxing, it’s the perfect place to take your family and share. Aside from the delicious food, the customer service is unbeatable. Chris is friendly and charismatic and professional and enthusiastic. I could go on and on. My point is this: go here. Order all the things. Then repeat. Hangar Bay Cafe has filled a much needed niche in Jacksonville, and we look forward to seeing them thrive. Tagged Casual, Fried Chicken, good for families, Ramen. Bookmark the permalink. It all makes me melted, looks delicious!